And when one thinks of garden rooms, one thinks of Sissinghurst. One of the great English gardens that I think of as the big S-es, the others being Stourhead, Stowe, and Studley Royal. The concept of the 'garden room', is, of course, an ancient one, with roots in the giardino segreto and the medieval cloister. It reflects the idea of nature as something to be tamed (see previous post), and extends the house--emblematic of civilization and a constructed safety--into the garden, creating an area that though outdoors is demonstrably separate from the dangerous wilderness. The concept has waxed and waned, repeatedly being discarded and revived, and held a natural attraction for Sackville-West (whose family seat was a Tudor house) and her husband Harold Nicholson, after they purchased Sissinghurst in 1930. Though Vita initially knew little about gardening, the landscape was open to the public by 1938. A fact which, as I begin my own large-scale garden, I find inspiring. Harold laid out the gardens, with strong axes based around a remaining sixteenth century tower. 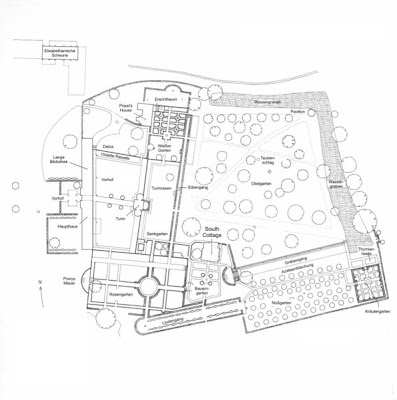 Note on the plan that a large area is wisely kept open, however, for relief from and contrast with, the enclosed rooms. Compression--and the Sissinghurst gardens are very dense--always needs release. 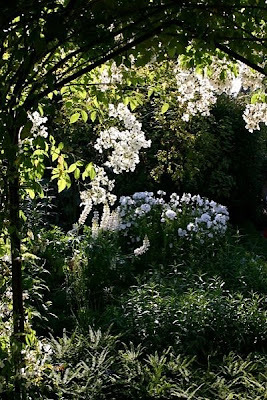 Vita added the luxuriant plantings, and thanks to her garden columns for the Observer, her planting choices are well known and have been maintained. The carefully-colored planting arrangements of the rooms, most famously the White Garden, are well discussed elsewhere. But I'm more interested in the walls. A parterre is traditionally composed of short 'walls' surrounding floral plantings which are designed to be looked over and down upon. At Sissinghurst, I felt as though I was *in* the parterre, with its walls grown up tall around me, like Alice after drinking the potion. Cursorily--and this is non-scholarly speculation--it seems to me that the fashion has swung towards tall walls and secluded garden rooms in times of uncertainty and fear, and turned again to low-profile designs, invisible boundaries and long vistas in times of confidence and prosperity. At least in English gardens...as we shall see later the American landscape has really never left the open park. Your thoughts? I saw the Sissinghurst episode of the Great Gardens of England a couple of months ago. Absolutely fantastic. There is certainly no shortage of imagery around. Hi! 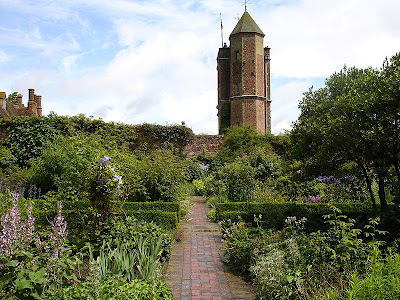 I know this is an old item, but if someone reads it, I must inform that there is a book called Sissinghurst, about the wonderful garden, the history and perennial border plans. I have the book at home in Stockholm Sweden translated actually from English (Publisher: Frances Lincoln Ltd) to Swedish. And, as a matter of fact Im writing a book about gardens of England now myself, which will be published in Swedish in March 2010. Sissinghurs is my first chapter.